A moose spotted by state wildlife staff from a helicopter. 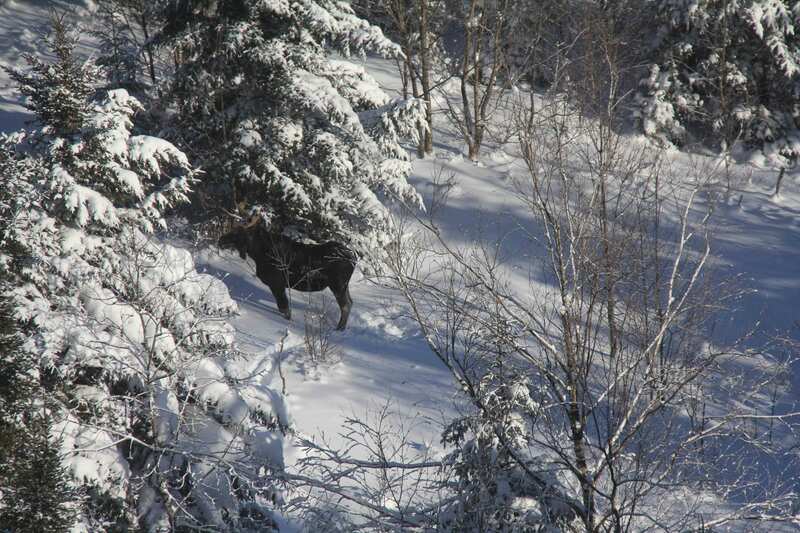 Photo courtesy of DEC.
New York State wildlife staff spotted 175 moose in 83 groups this winter during aerial surveys for the animal. Department of Environmental Conservation wildlife staff conducted the helicopter flights in January over seven days, logging about 42 hours of flight time. 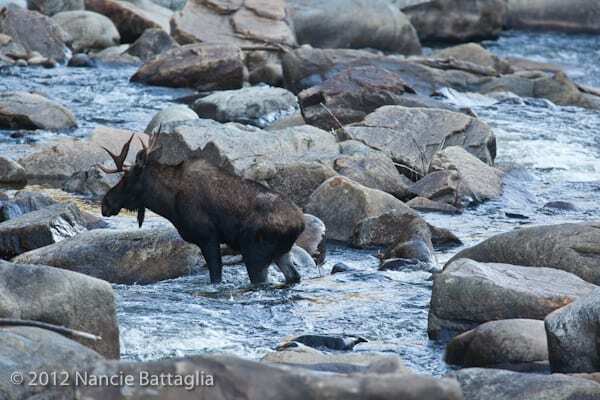 Researchers will use the data from the 2019 survey to refine DEC’s estimate of the Adirondack moose population, which currently stands at about 400 animals. 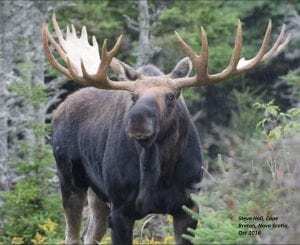 In addition to estimating moose population size, scientists are also looking to improve the understanding of moose survival and reproductive rates and to assess moose diet and health through this study. 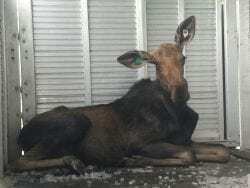 DEC hopes the information will help reduce human-moose conflicts and aid in managing moose populations in throughout the state, according to a press release. DEC didn’t find any signs of a winter tick infestation on the moose, a good sign for the population. In other Northeastern states, moose populations have seen declines, in part because of winter ticks. Winter ticks can be found by the thousands on moose and can eventually kill them. It also hurts the animals’ ability to reproduce because the ticks cause the moose to be in poor health. There are six moose in the state with GPS collars, which allow biologists to track their movements and determine the number of calves that are born to adult females. Adult female moose usually have one or two calves in late May or early June every other year. In past aerial surveys, biologists have seen a ratio of about 0.5 calves per cow. This year, the calf-to-cow ratio was approximately 0.37 calves per cow, and no twin calves were observed during the survey. The mid-winter survey is in the fifth year of a multi-year partnership with researchers from the Stat University of New York College of Environmental Science and Forestry (SUNY-ESF), Cornell University’s Cooperative Fish and Wildlife Research Unit and Animal Health Diagnostic Center, the Biodiversity Research Institute, and the Wildlife Conservation Society.